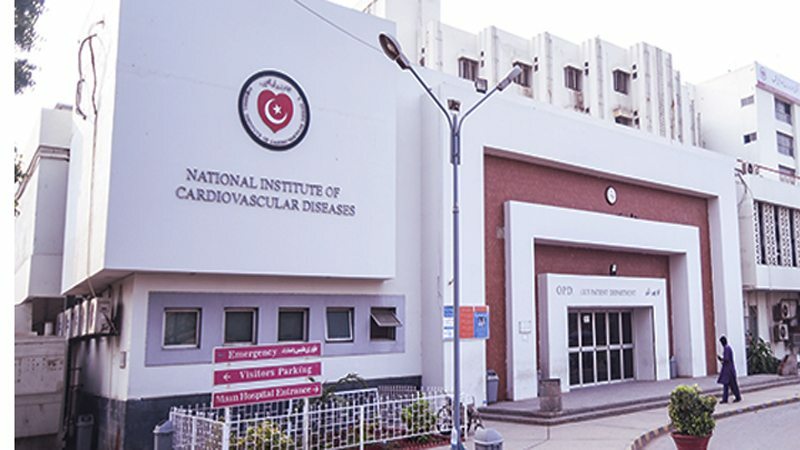 KARACHI: Number of Chest Pain Units (CPUs) of the National Institute of Cardiovascular Diseases (NICVD) would be enhanced to 17 in Karachi by the end of this year, NICVD Executive Director Dr Nadeem Qamar announced. This was stated by Dr Qamar while speaking to the media on the occasion of World Pharmacists Day, which was observed at the NICVD on Tuesday where pharmacists briefed patients and their attendants about their medicines and how to take them to remain healthy and fit. “Currently we have seven Chest Pain Units functioning at different places in the city but by the end of December this year, we would have 17 Chest Pain Units functioning at various important points of the city”, Prof. Nadeem Qamar said adding that initially medicines would be provided at some of the CPUs and later on, at all the units to facilitate patients and to lower patients’ load on the main NICVD building. Prof. Nadeem Qamar informed that at the moment they were providing free medicines to half a million patients annually, saying NICVD was the only hospital in the public and private sector in entire Pakistan, which was providing free of cost, quality medicines to such a large number of patients in the country. “At the moment we have a team of 50 qualified pharmacists led-by Chief Pharmacist Jibran Bin Yousuf which is serving the patients with full enthusiasm and striving hard to prevent them from medication errors”, he said adding that these pharmacists were fully alert to prevent an overdose or any other error which could result in any possible damage to patients’ health. Dr Qamar maintained that NICVD is actually saving money by employing a team of qualified pharmacists as the duration of patient stay had drastically reduced at the hospital due to interventions by the pharmacists while they were also helping in infection control which is the biggest cause of patient mortality at healthcare facilities. In addition to that, NICVD pharmacists are running an Anti-coagulation clinic, where patients who are given blood thinners are monitored regularly so that they could be prevented from haemorrhage and related health issues, he informed. Prof. Qamar said patient load on NICVD was growing with each passing day despite the establishment of Satellite Centers in different cities of Sindh and added that they would soon be having a new OPD building after which NICVD’s emergency room would be expanded to accommodate growing number of patients being brought to the emergency. NICVD’s Chief Pharmacist Jibran bin Yousuf claimed that they were providing free medicines to 800 to 1000 patients and based on their rough calculations, NICVD was proving medicines worth Rs. 2 million to its OPD patients on daily basis. “Today we have established a patient awareness camp at the hospital where we are providing consultancy services regarding medicines to patients while different tests are also being conducted to improve their dosage of medicines as per their health conditions”, Jibran said adding that they were following international protocols for the dispensation of medicines to the patients. In order to reduce medication errors and any possibility of theft, Jibran said, they have put in place an Electronic Requisition System (ERP), which helps doctors and pharmacists to dispense right medicines incorrect dosages to the patients so that chances of medication errors could be minimized to a large extent. “Every year, around half a million people die due to medication errors so we at the NICVD are highly vigilant so that patients could be prevented from accidents and errors related to medicines”, he added. On the occasion, a patient Arjumand Azhar also narrated his health situation when he had a heart attack and was taken to a private hospital, who instead of providing him with any first aid, asked his attendants to take him to NICVD for saving his life. “Within an hour on arrival at NICVD, I had my angioplasty after a heart attack and I was shifted to the recovery room. When I was leaving, I asked for the bill and they told me, ‘please have tea and biscuits’ and leave as they don’t charge any money from the patients anymore”, he added.